ASTM B381 / ANSI B16.5 / UNS R50400 / DIN 3.7035. Titanium Gr 2 Flanges, WERKSTOFF NR. 3.7035 Flanges, Titanium Grade 2 Flanges, DIN 3.7035 Flanges, ASTM B381 Titanium Gr 2 Slip on flange, UNS R50400 Flanges, ANSI 16.5 Socket weld flange, Titanium Alloy Gr 2 Flanges Supplier in Mumbai, India. Titanium Gr 2 Forged flanges, Ti Alloy Grade 2 Reducing flange, Titanium Gr.2 Blind flanges, Titanium Gr 2 Long weld neck Flange, Titanium Gr 2 SWRF flange, Titanium Gr.2 SORF flange, Titanium Gr.2 Plate flange, Corrosion Resistant Titanium Gr 2 Flanges, Ti Alloy Grade 2 Spectacle blind flange, Titanium Gr.2 Ring type joint flange, Titanium Alloy Grade 2 Screwed flange, Ti Gr 2 Tongue and Groove flange, Titanium Gr 2 Flanges Exporter, Titanium Gr.2 Welding neck flange, Titanium Gr 2 Threaded Flanges. 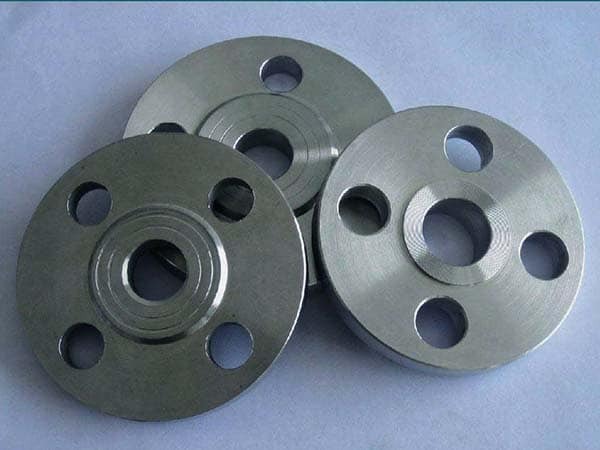 Jayesh Metal provides the broad range of Titanium Gr 2 Flanges to our patrons in different shapes; specifications as well as sizes, known for its durability rust resistance, and high quality, these flanges are being used in several industries, around the world. Some instances of aerospace applications in this flange have included airframe skins, brackets, galley, and ductwork tools. Constant service temps can arrive above 800-degree Fahrenheit with intermittent and occasional service up to 1000 degree Fahrenheit. 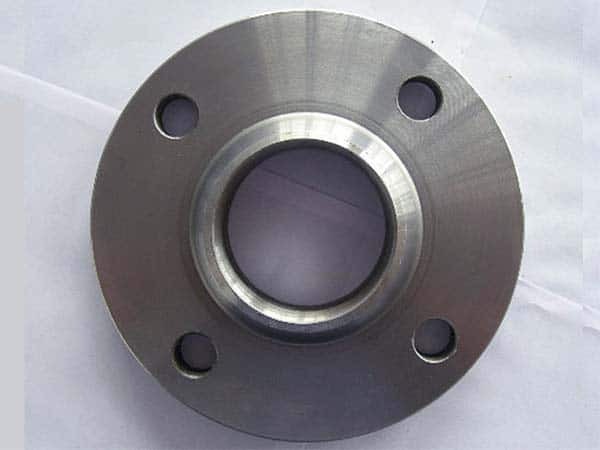 This titanium flange is the common lightweight as well as high strength alloy. Also, as per all the international standards and industrial guidelines, it is manufactured under expert’s supervision. If we talk about its size that is from ½ to 18 and the standards are DIN flanges, BS flanges, ANSI flanges, ASME flanges, EN flanges, ASTM flanges and so on. It has different pressure ratings like 1500#, 300#, 600#, and 900# and so on. It is mostly used at the place or in the application which is of high temperature and pressure as well. Because of these mentioned above features, it is considered best and suitable for use in numbers of applications. Along with these, different tests are done such as radiography test, third-party inspection test, non-destructive test, hydrostatic test, pitting resistance test, visual inspection, and so on. By doing so, the high quality and solidity of it can be assured and then it is supplied to patrons with the good packing services anywhere and anytime they want. So, buy Titanium Gr 2 Flanges from us, according to your needs. titanium gr 2 flanges, alloy gr 2 flanges manufacturers, ti grade 2 flanges manufacturer in india, titanium gr 2 flanges manufacturer in mumbai, titanium gr 2 flange stockholders in india, titanium alloy gr.2 flanges manufacturer, titanium gr 2 wrought austenitic flanges, titanium alloy gr 2 flange price list, titanium gr.2 flange astm, titanium 3.7035 screwed flanges supplier, titanium alloy gr 2 pipe flanges, ti alloy flanges price list, titanium gr 2 price list, titanium gr 2 flanges pipe, gr 2 flange manufacturer, ms grade 2 flange manufacturer in india, titanium gr 2 flange manufacturer india, titanium gr 2 loose flanges, coastal flange, ti gr 2 dealer in mumbai, titanium sus grade 2 weld neck flanges, titanium gr.2 flanges manufacturing companies in india, titanium grade 2 flanges suppliers, titanium gr 2 supplier in india, titanium alloy gr 2 spectacle blind flanges, titanium gr.2 exporter in india, titanium gr 2 manufacturer in mumbai. Algeria, Poland, South Africa, Indonesia, Greece, Sri Lanka, Canada, India, Estonia, Chile, Bhutan, Austria, Denmark, Hong Kong, Nigeria, Jordan, Qatar, Belarus, Egypt, Poland, Switzerland, Bahrain, Philippines, Belgium, Bulgaria, Colombia, Trinidad & Tobago,Tunisia, Mexico, Lebanon, United Arab Emirates, Saudi Arabia, Romania, Japan, New Zealand, Ecuador, Ukraine, Libya, Afghanistan, Puerto Rico, Macau, Mongolia, Russia, Pakistan, United States, Yemen, Australia, Czech Republic, Norway, Brazil, Venezuela, Croatia, China, South Korea, Netherlands, Bangladesh, Finland, Ireland, Mexico, Kazakhstan, Oman, Nigeria, Costa Rica, Iraq, Namibia, Thailand, Bolivia, Portugal, Gambia, Iran, Ghana, Gabon, Peru, Nepal, Vietnam, Israel, Kuwait, Italy, Taiwan, Iran, Sweden, Hungary, Lithuania, Argentina, Slovakia, Singapore, Tibet, Chile, Morocco, Turkey, Zimbabwe, Malaysia, Germany, Kenya, United Kingdom, Azerbaijan, France, Spain, Angola, Serbia. Ahmedabad, Bengaluru, Secunderabad, Granada, Noida, Riyadh, Ernakulam, Sharjah, Gurgaon, Dallas, Houston, Chandigarh, Thane, Ulsan, Coimbatore, Singapore, Aberdeen, Sydney, Cairo, Brisbane, Atyrau, Bhopal, Dammam, Jeddah, Abu Dhabi, Pimpri-Chinchwad, Jaipur, Bogota, Haryana, Ho Chi Minh City, Madrid, Vung Tau, Rajkot, Nashik, Kuala Lumpur, Mumbai, La Victoria, Jakarta, Kuwait City, Hong Kong, London, Bangkok, Calgary, Surat, Port-of-Spain, Gimhae-si, Howrah, Chiyoda, Istanbul, Hanoi, Caracas, New York, Ankara, Melbourne, Mexico City, Rio de Janeiro, Moscow, Colombo, Lagos, Tehran, Nagpur, Perth, Courbevoie, Chennai, Santiago, Jamshedpur, Navi Mumbai, New Delhi, Baroda, Faridabad, Seoul, Hyderabad, Muscat, Vadodara, Pune, Ahvaz, Toronto, Doha, Geoje-si, Dubai, Petaling Jaya, Karachi, Visakhapatnam, Lahore, Kolkata, Busan, Milan, Kanpur, Al Khobar, Algiers, Al Jubail, Thiruvananthapuram, Montreal, Manama, Los Angeles, Ranchi, Indore, Ludhiana, Edmonton.